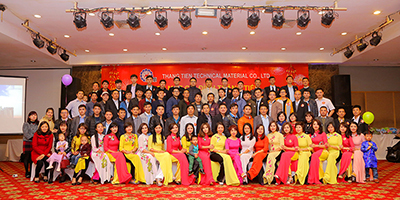 Thang Tien Technical Material Co., Ltd would like to announce to all customers, partners and all staffs of the summer holiday in 2017. Summer Tours - Visiting - Vacation is always one of activities organized by Thang Tien Technical Material Co., Ltd for employees. In addition to the purpose of motivating, motivating the staff spirit, the annual summer tourism activities are also thanks from the Board of Directors to the efforts of employees who have worked and contributed ceaselessly throughout a year ago. Thang Tien Technical Material Co., Ltd would like to inform all customers. At the same time, we would like to contact you before or after the above time. In case of necessity, customers can contact directly through the phone number of the individual to contact. We would like you sympathize for any incidents or problems that may arise during this time. We sincerely thank the attention, cooperation, support of customers and Partners . Wish Customers and Partners a happy summer!